It is of course the lovely Damson I mentioned in my last post. Remember the allergic reaction on my hands? The one that made it difficult to knit my Hermione Socks? Well I decided to see if knitting with larger needles wouldn't hurt so much and I put down my Socks and cast on the Damson because the Malabrigo sock was just sitting there all pretty. I had done rather a lot of it since Friday, I had just finished the garter section, when disaster struck. 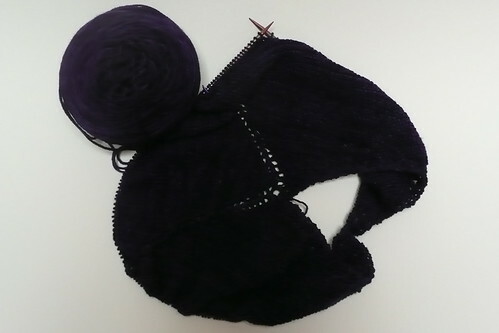 I had made a mistake, I started to tink back and I couldn't find where I had gone wrong but I didn't have the right number of stitches, and I didn't even have the right number for it to be a couple of extra or missed rows. This I believe was karma coming to get me for breaking a promise to myself, despite the excuses. So, being the cut throat knitter that I am I attached the other end of the ball of yarn to my winder (so glad I have that now!) and unravelled the whole lot into a new ball, and started again. I am taking my time with this one since I suspect it may have been doing the knitting in the car and around Nottingham University open day that caused me to make a mistake, so this is a strictly sitting at home project for now! 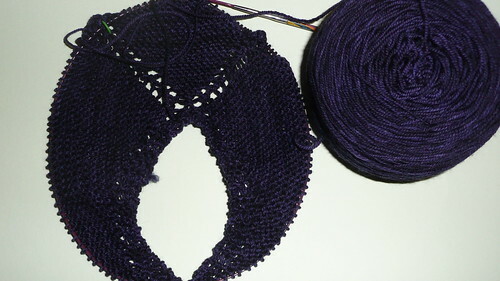 This is the first shawl I have knit and I have to say how cool the construction of these things is, starting with 3 stitches and it growing and growing is great and I am glad I have stocked up on patterns so that I can knit more, though hopefully without making the same mistakes! 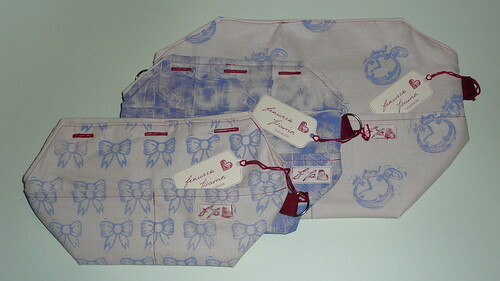 I am really proud of how these little bags have come together, it has been a lot of hard work from thinking about the shape and the designs to things like branding the items to create the right image (do you like the red topstitching? I think it looks rather snazzy!). I actually can't wait to actually start selling some and shall update when they are available. I shall be shouting from the rooftops! I have also learnt that there is a reason that sweat shops are called sweat shops, sewing is hot work! 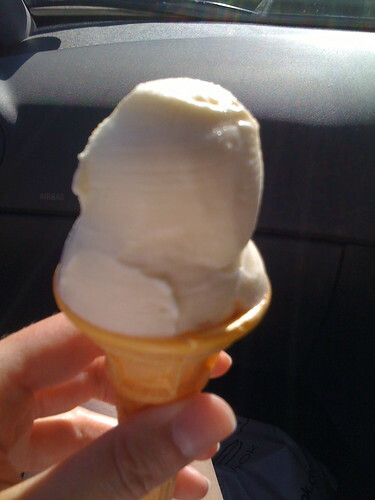 Good job I have some Blyton Ice Cream to cool me down, in my new favourite, Banana!